With Gods Grace is holding their 3rd annual School supplies drive. Our goal is to get 250 backpacks filled with school supplies for local children. 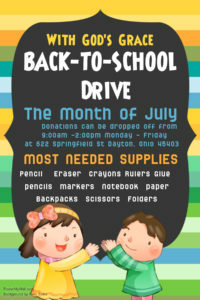 Mark the dates With God’s Grace will be collecting school supplies the whole month of July Monday – Friday from 9am to 2pm at 622 Springfield st Dayton, Ohio 45403. You can help make a difference. Many families are struggling. With unemployment, and more than 30 million students enrolled in the free and reduced meal programs, many parents are unable to provide the basic school supplies their children need to be effective. In addition, schools across the country are facing severe budget cuts and lack the funding to purchase necessary supplies. You can help children in school by giving them the tools they need to succeed. Donate school supplies!! Feel great about ensuring that children start the school year with the tools they need to succeed. Help teachers by providing them with proper tools for their classrooms, so they don’t have to spend money from their own pockets. By providing school supplies, you are supporting students, teachers and your local schools. Donate today!! When our communities, especially children have access to healthy, well-balanced diets, everyone benefits. That’s the kind of future With God’s Grace is trying to create. This evening With God’s Grace held our mobile at Emmanual Baptist Church at one of our partners. 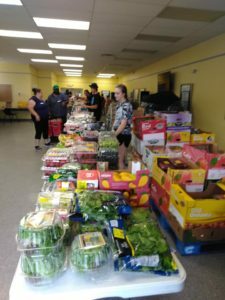 147 Families received 2 cooler and dairy items, 12 non-perishable food items, 6 breads, 1 bakery, 4 packages of fresh produce, 1 bag of bell peppers, 2 bags of spinach, 2 cabbage, and a brown lunch meal for you to enjoy. 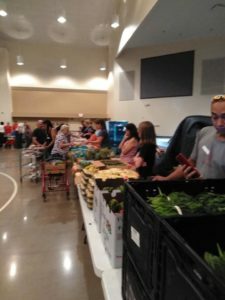 With God’s Grace would like to thank the 29 volunteers for coming out to help fight hunger in Xenia, Ohio and make a huge impact showing our families they are loved. This evening 213 families came out to our East Dayton mobile location on Xenia Ave. Our families received 4 cooler and dairy items, 4 packages of fresh produce, 3 bread, bakery, 14 items of non-perishable food items. With God’s Grace would like to thank the 8 volunteers that came out to fight hunger and staying late till all the families were served. 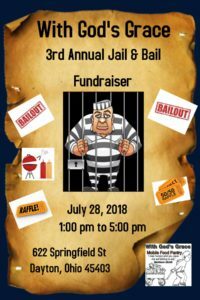 If you can’t make the event this year, you can do Virtual Jail & Bail to help With God’s Grace, raise operating cost Our goal this year is $24,680. With God’s Grace will be setting up a “jail” at our warehouse, and we’re seeking 60 volunteers to agree to be arrested in order to fill our jail. Volunteers will face the judge upon coming to court at our warehouse and will be determined by their bail amount from the judge..
Each hour, new inmates will enter the jail, and they will have one hour to raise their bail money. This can be done by calling friends, asking passersby, and even having friends and family that can’t make the event or not in OHIO can donate via PayPal. Forms of payments accepted are cash, checks made out to With Gods Grace, and PayPal. All donations are tax-deductible. You can start collecting donations for you Jail & Bail after your mug shot is posted. 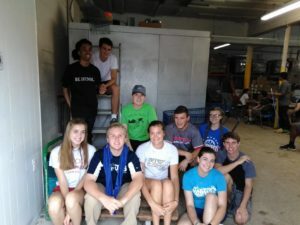 On Monday With God’s Grace had a group of students from Carroll High School volunteering at our warehouse. The students were able to help set up for Wed mobile. 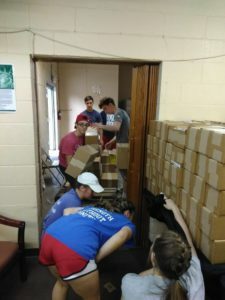 With God’s Grace is excited to have Carroll High school students volunteering all week at With Gods Grace.